In history, everything happens twice: First as a tragedy, later on as a comedy. 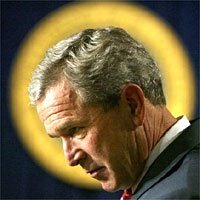 I am talking about the infantile presidency of John Walker Bush. His boots are not for walking. Those bootlets are for playing around, like the fourth Roman emperor Caligula did, closely monitored by his first century Cheneys and Rumsfelds. Give the people a clown, so that we can do our business in the background. "...Here is the key passage in Senator John McCain's anti-torture amendment to the 2006 Defense Appropriations Bill (which the Bush administration has threatened to veto if it arrives so amended): "No individual in the custody or under the physical control of the United States Government, regardless of nationality or physical location, shall be subject to cruel, inhuman, or degrading treatment or punishment." I made some comments on American matters in my European blogs (and blogs) recently, but I do not want to merge into the easy Bush-bashing intellectual European mainstream blogosphere. I may be joking, but I am deadly serious. European problems are also too serious to be mixed up into an outsiders' view on actual trends in an USA, that I have learned to love, to admire, to learn from. The USA has a right to be considered on itself, from its own history, its own values and standards. So that's why the US comments will be here, from now on, and not elsewhere. My dear friends, of course I am biased: I read (daily) the New York Times, the Washington Post, and the Los Angeles Times, finding my way in them through Slate's today's Papers or, since May 2005, The Huffington Post. But, I bought also a web subscription to The Weekly Standard that enables me to download the whole paper every week! I cannot and will not try to describe my complete desperation, reading attentively those (neo-)conservative texts, following their leads to still more despairing conservative religious websites and studying their neoconservative books. I will deal with that later, as we dive more into this matter. I will lean heavily on those many intelligent, competent and courageous American commentators and intellectuals, who are looking into those developments from within. Tom Engelhardt is one of them. Rightly, he sets the standard of American culture and civilisation at this side of torture. Apologising, justifying torture as a systematic way to fight a war against 'terrorism', is as un-American, as un-Enlightenment as you can imagine. These are the forces of Darkness, operating in the shadow of an infantile Presidency, that makes me remember the Roman emperor Caligula ("Soldiers' Bootlet") living and dying during the first half of the first century. Look, what Bush was wearing, that 1st of May 2003, landing on the Aircraft carrier, chanting "Mission Accomplished": Elegant, half-calf, military pilots' boots! Caligula is back!! It cannot be a mere coincidence, that the first century aristocratic upstart opted for the same gimmick as his twenty-first century colleague, to seduce the soldiers of the imperial cohorts. And wasn't it also Caligula (the encyclopedia Britannica says "no") who nominated his Horse as Consul, in order to humiliate the Roman Senate? Bush, nominating his devoted secretarial horse Miers, didn't he do something, the authentic Caligula would have been proud of? I'll try to find out, how in the world the Weekly Standard cynical rationalists, manage to keep a flock of God-fearing Americans at their throes.